Nearly everything around you is covered by copyright and patent law, these are laws which have evolved over the last few hundreds years and now create a massive regulatory burden on our society. At some point we need to ask the question: are these laws really accomplishing the purpose they were created for? We’re here to warn you, they’re not. Copyright laws create a monopoly over a creative work. Copyright holders have the right to control use and distribution, and to claim moral ownership. Patent laws grant monopoly control over the expression of an idea, and rights-holders can prevent others using an idea, or demand fees for licensing it. These laws were originally intended not only to ensure compensation for the time, energy, and money invested into creation of new ideas and original works, but also to ensure a progressive commons, a cultural centre to our society where everyone has fair access to the latest advances of the sciences, from new inventions and discoveries to access to the latest works in the arts, music, literature and theatre. These laws were enacted hundreds of years ago to increase our access to knowledge, culture, and information while also ensuring a reasonable incentive was there to create and share. Copyright reform. Because sharing turns content into culture. Australia now has an internet censorship regime which was legislated in 2016 allowing copyright holders to take down entire domain names without any serious consideration of the collateral damage. Increases in copyright duration and added restrictions to fair use is stunting cultural growth and causing the permanent loss of creative works through the narrowing of the public domain. No creative works will enter the public domain in Australia until 1 January 2025, and only then if copyright lengths are not extended again by legislators and new supposedly free trade agreements, which has happened many times before. Gene patents ensure private interests are valued over medical research, and enable the imposition of huge costs on sick and dying patients. The worst example is where intellectual property laws have become a threat to life itself, where drug patent holders use their monopolies rights to demand unaffordable prices for AIDS and cancer treatments, particularly affecting poorer countries, but also the Australian budget through the Pharmaceutical Benefits Scheme. The creators of this world have lost their rights to middlemen, the publishers and distributors (which we call the copyright industry), while fair and reasonable access to culture has fallen heavily against the public. We are all being denied fair access to the cultural and scientific works of our age. Successful intellectual property laws will allow society to progress, and basic rights to endure, while adequately protecting inventors and creators. Currently most creators aren’t getting rich off of their endeavours, although a lot of middlemen rights-holders are, it’s time for reform and that is what the Pirate Party is here to do. Protection of artists and creators is paramount, as they are the only legitimate beneficiaries of copyright. Changes to copyright have for a long time negatively impacted on creators, as draconian enforcement has caused the general public to lose respect for copyright laws. The Pirate Party supports the decriminalisation of all non-commercial file-sharing and similar practices, as the sharing of culture is an innate human behaviour. For further detail on how file-sharing and respecting creators can be balanced, please see Artists and the Internet (link). 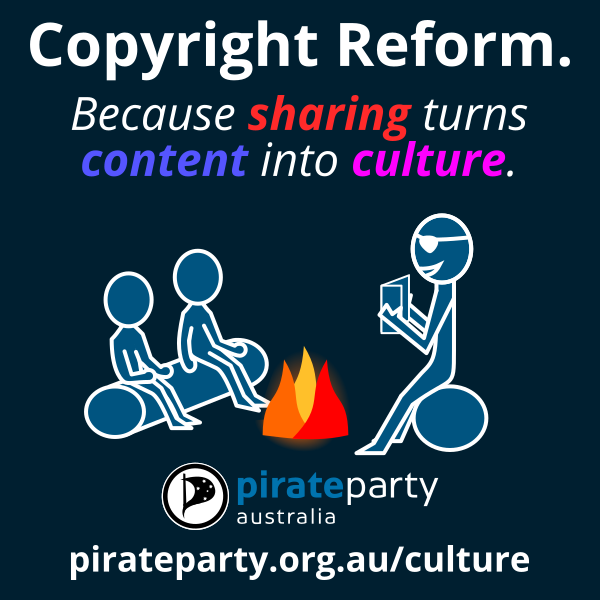 Pirate Party Australia suggests copyright duration should be contained to around 15 years, as this is calculated to be the optimal term to drive maximum creative endeavour. Fair use needs to be protected and creative remixing and reuse of existing content must be allowed. Patent duration and scope needs re-alignment to the fit the reality of the modern world, such as explicit protections for public research, and requirements that patent litigants demonstrate active use of patents as grounds for their legal defence. First principles of patent law (which ban patents on products of nature) should be observed, and patents on organisms and genes overturned. We also support the replacement of pharmaceutical patents with less harmful incentives to engage in pharmaceutical research. The intention is to ensure the rights of the public are balanced with those inventors without whom innovation would stall.